At Fastway Couriers, Toowoomba we offer a unique approach to courier services; specialising in economically priced, personalised courier delivery and pick-up services for businesses, large and small. 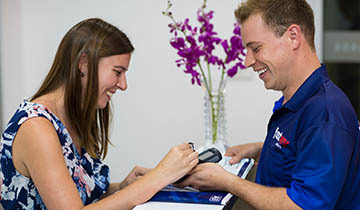 Locally owned and operated by Regional Franchisees, Philip & Bronwen Jeffrey, our Toowoomba team of Courier Franchisees offer a reliable and friendly courier service. Our local area includes the greater Toowoomba region, including (but not limited to) Warwick, Millmerran, Dalby, Crows Nest, Gatton and Laidley.